Well I did it. I finished my pillow for round 9 of the Pillow Talk Swap. You have all seen pictures of the progress but it is officially complete and may well end up in the hands of its new owner today. I sent it off last week to my partner and I can’t wait to see when she gets it! Are you ready to see the finished product? It’s okay if you look at the picture a lot…I look at it ALL the time. lol I won’t see it again, so these pictures are what I have to show for my work. And I’ll admit, they make me pretty happy. Happy pictures. The pillow is fully lined, quilted and hand quilted. It has a back flap covered zipper and a bound edge that is hand sewn. Phew! It’s work to just write that out. But to me, it’s not worth doing all that work on the front of the pillow, only to crap out on the construction details. So I made sure it was all put together well. It is 24″ square….which is BIG for a pillow. But again, I didn’t want to try that pattern and not make it worth it…and that’s the size I needed to get the amount of the flowering snowball pattern that you see. Hopefully in this picture you can see the quilting details that went into the front. I machine stitched in white around every curve, making sure the pillow top was well in place. Then I came back with embroidery floss in 10 different colors and added a bit of hand quilting. There are two shades of each color to echo the two shades of solids in the pillow per color. It’s all in the details. Those are the logistics of the pillow and I hope you find them interesting, but I wanted to share with you WHY I made the pillow. I am SO OFTEN asked “How can you give that away? !” when I make a swap item. I’ll admit that the items I make to give away in swaps are some of my most treasured pieces. I put my whole heart into each one and then send it on it’s way. But I don’t even start out with the mentality that these items ever belong to me. They belong to my partner from the moment I begin to come up with an idea that is hopefully perfect for that person. Yes, they are all a part of me…I make them. But they are not mine. This pillow is no exception. It would not exist if not for my partner. SHE was the inspiration for it…her life, her style, her loves. It is hers. Really nothing makes me happier than creating something for someone that they will love. My partner always has at least an idea of what it takes to make what I do for them. They appreciate the fabrics and time involved. And it is hopefully what they would make for themselves if they had the time and energy to tackle. Everyone deserves some extra special quilty love. And this is my little way of giving that, one person at a time. 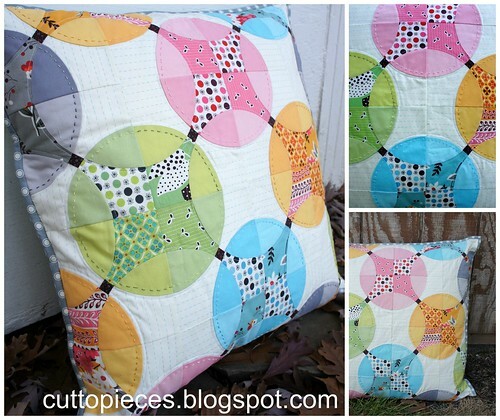 Linking up to the Blogger’s Quilt Festival as well! 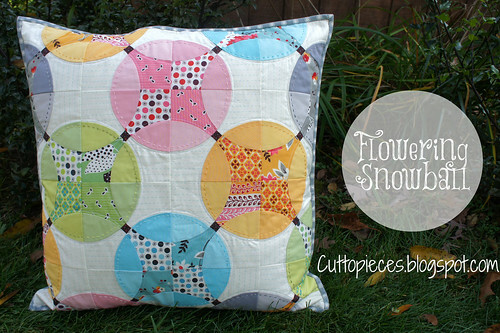 It's absolutely gorgeous, and I love the hand quilting as well! I also get that question all the time, and I think you put it into words perfectly. You have a very lucky swap partner!! That pillow is absolutely gorgeous! Beautiful pillow! I love your explanation on how you create for the person, not yourself. I feel the same way! In some ways it is easier to make something for someone else, just to see (or hear about) the joy it brings them. What a wonderful way to share the love! … and it makes it just a little easier to send something beautiful away to know that we will get something lovely and made with love just for us back in reteurn! It's wonderful. I agree with you about giving swap items away. It's easy for me because it was always theirs to begin with! I sew mainly for others anyways. It makes my heart smile to give stuff away. I absolutely LOVE the pillow! It turned out amazing. It really is lovely and I feel the same way about giving things away. You are a wise woman with a generous heart. I'm glad you made this quilty treasure for your partner. Thanks for sharing it with us. I added the photos to my favorites so now the pillow feels like it's mine too. It is beautiful! You know I am the same way! I have not yet kept a single thing I have made! Soon I will make something that is for me! Perfectly said- you are just the BEST! I LOVE how it turned out, and your partner will be taken back when she realizes it's hers!! 🙂 So fun! Your pillow is beautiful. I have stared at it several times trying to take it all in. It is almost beyond words for me. I love everything about it, your choice of colors and how you placed each one. I just keep saying wow over and over again. Your partner is a very lucky person. I just adore this, Angela. I hope you don't mind, but I may try to do something similar, it's just so gorgeous and a great way to use FMF! Beautiful work my friend! And how true at the end — that it wouldn't exist if not for them! It is fun to sew for someone who will appreciate it! I am in love with this pillow. And you are right, sewing for people who sew is the best. They get why it's special. This is so pretty. Your fabric choices and everything are just right. So many things to love about this, but that hand quilting takes the cake for me. Fabulous! Great colors and prints…really enhance the lovely pattern. Each time I've see pics of it on your blog, I notice/admire something different…this time it was the tiny black bits that sort of connect the pieces. What a lucky swap partner! This pillow would love so good sitting on my bed. I just love it. Yep, it's just as gorgeous finished as I thought it would be. Love it, love it, love it. Thinking I might have to start joining swaps. Lol! I was waiting to see the final reveal. It is really wonderful. Great job. Really lovely! I like the pattern a lot. If I am the lucky recipient I will be happy to match up the solid colors for you. Ha! I should be so lucky. The very fortunate person who receives this will surely treasure it. That is stunning! You are right, finishing it the way you did simply added to how beautiful it is. And I love the pattern too! This is just gorgeous. I keep admiring it and going back to look at it!! It is seriously seriously awesome. I love it so so much! This is so very pretty. I will google and see what I can find. Truly, TRULY beautiful! I am sure you have inspired MANY with your lovely work! This is absolutely beautiful! I love the design, but it's the colors. The fabrics go together perfectly. How they are mixed. They just pop! ahhhh!! Love it! If parting with this pillow was a challenge, I hope it alleviates some of that pain to know that it was absolutely well received. My wife *literally* squeeled when she saw where this package was from. "I think this is IT…" referring, of course, to a pillow she had absolutely admired. An hour later, after reading and watching tv, I look over and see her with the goofiest grin still admiring the stitches. She told me the epic story of your blog post about this pillow, the amazing experience of her wondering what pillow she'd get, and her experience of finding the package on the counter. *gushing* I appreciate how happy this makes my wife. Thank you. I love this so much!! Do you know of a good tutorial on the construction. I'd like to add lining a zipper flap and all to my pillow talk pillow. This is just fantastic! You do such amazing work 🙂 I know Brooke LOVES it! Gorgeous Malorgous!!! I LOVE LOVE LOVE this pillow. If you need my name and snail mail address just let me know and I will send it to you. Happy is indeed the perfect description for this pillow and all you have shared about it! Just wonderful! This is really a beautiful pillow. I love the colors!!!! I absolutely love it! Every detail is exquisite! Has your partner received it yet? She's going to be over the moon! I loved seeing your IG sneaks of this one! It's so rad!! Angela, this is such a gorgeous pillow – and I love the sentiments your shared about giving it away. It was so fun to see Brooke's reaction. What a good pair you are. Angela, this is gorgeous and such a generous gift! I would like to try to make one, can you post where we can find the pattern? My mind is blown by that pillow! I also wanted to tell you, I belong to a swapping site called swap-bot.com. I thought what you said about the pillow belonging to your partner from start to finish was exactly right, so I shared them (along with credit) on my profile: http://www.swap-bot.com/user:sugarskull. If this upsets you, let me know and I'll remove them. But it is the perfect response for that sneaky questions! Angela, did you follow (or make) a tutorial for the lined back? I am trying to finish a pillow this week for a holiday swap, and I'm not the most advanced piecer/quilter, so I'd like to make sure to nail down the details. 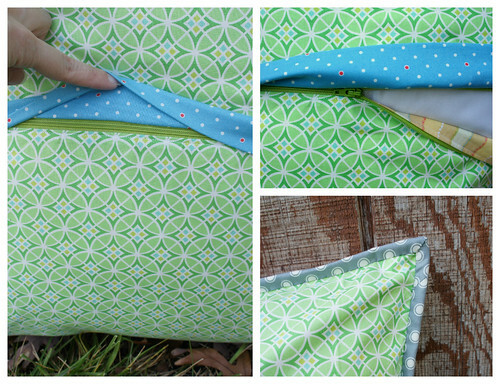 I was planning to use the tutorial for the little flap zipper like this. Thank you!